Steps to Delete Old Android Devices from Google Play store Install List – If you are really a Big Fan of Android in other way; Google keeps track of apps you download and also keeps a record of all your Android devices. And you have been really looking for How to Remove Old Android Devices from Google Play Install List because, sometimes it’s get you confusing. 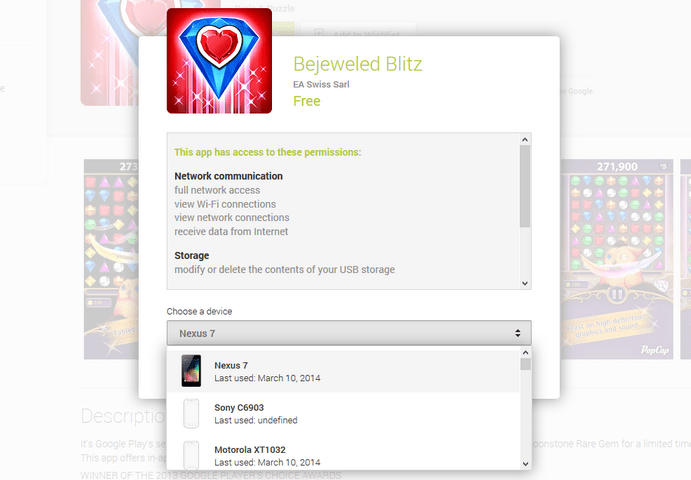 Be is to delete Android devices from Google Play store Guide. Since review my Android smartphones and tablets week in week out, the amount of device in my list is somewhat extreme. However, When you’re on the Google Play store, you probably don’t want to see it if you’ve lost or may be sold an old Android device. So deleting or removing it will save confusion and avoid apps doing the same thing again and again. So for most of you who have been really looking for How to delete Android devices from Google Play store simply because, You’re not actually able to delete devices from your Google Play account, here is the STEP by Steps guide shown in menus. STEP 1: Open your web browser and navigate to the Google Play Store. STEP 2: Click the gear button in the top-right corner of the screen and select ‘Settings’. 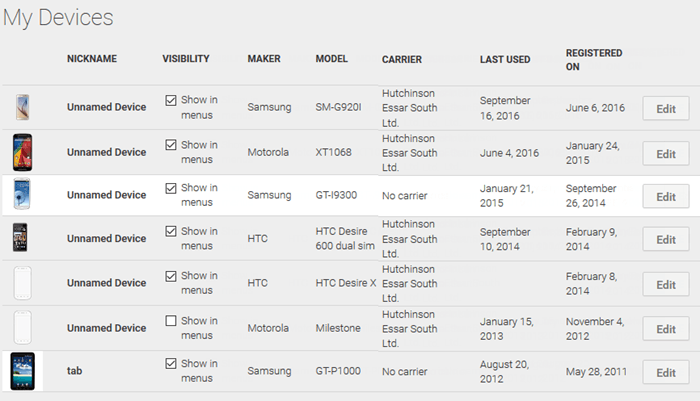 STEP 3: On this page you’ll be given a list of ‘My Devices’ and you can un-tick the ‘Show in menus’ box in the ‘Visibility’ column. So When you want to install a new app via the web store only your current and in-use Android devices will show up. See also: How to manually update an Android smartphone or tablet. Please Note: While you’re at it, you can also rename your devices for better organisation. Google will often use product codes for devices rather than the actual name which can be confusing. For example, LG-D802 instead of LG G2. 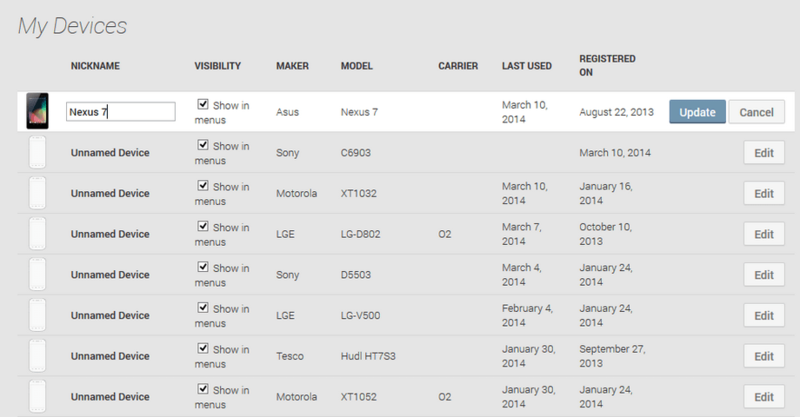 This could also be handy if you want to indicate who uses each device (if they are linked to the same Google account). So for those of big fan of Android with multiple devices, Check out how to rename them here With STEP by STEP Guide. STEP 1: Follow steps one and two from the above guide. STEP 2: Click the ‘Edit button on the device you wish to rename. STEP 3: Enter the new name in the box under ‘Nickname’ and when you’re done, click ‘Update’. Simple, and now your devices will show up with the names you want. Please SHARE this Post and Kindly improve us better on How to Delete Old Android Devices from Google Play store Install List with your suggestions and opinions by using the COMMENT BOX below for it.